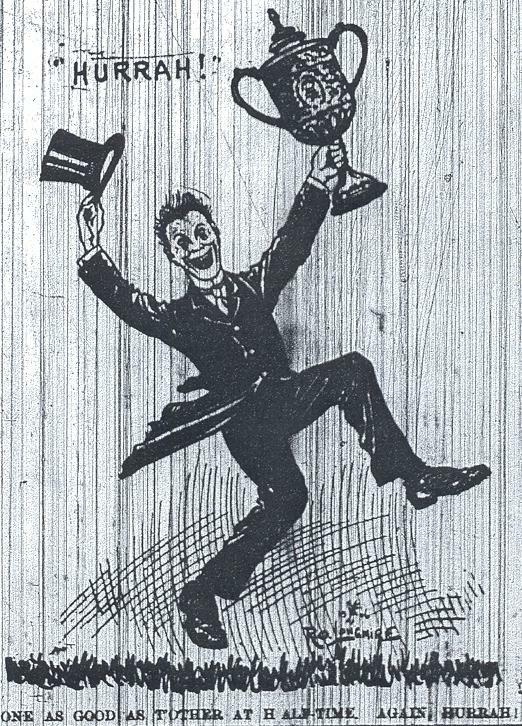 1901-1906: A rise from 2nd division to the title! - LFChistory - Stats galore for Liverpool FC! Back row: John Carlin, Alf West, Charlie Wilson, Sam Hardy, Ned Doig, Billy Dunlop, David Murray, Joe Hewitt. 2nd row: W. Connell (Trainer), James Hughes, George Lathom, John Hughes, Maurice Parry, Alex Raisbeck, George Fleming, Tom Chorlton, Tom Watson (Manager). 3rd row: Robbie Robinson, Jack Parkinson, Sam Raybould. Front row: G. Robinson, James Gorman, Arthur Goddard, Jack Cox, James Garside. in a collision with Woolwich Arsenal's goalkeeper. 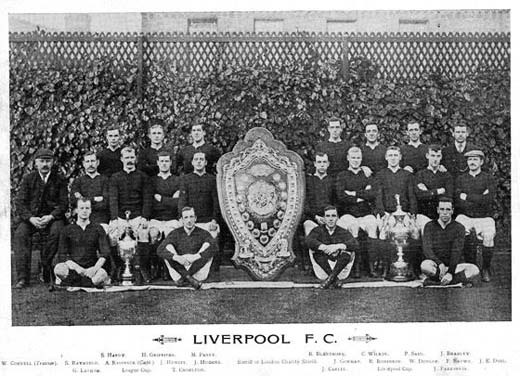 Liverpool’s opening game in the 1905-1906 season was a complete disaster. Besides losing 1-3 to Woolwich Arsenal, Jack Parkinson broke his wrist and didn’t play until mid March and Liverpool finished only with 9 men after Dunlop twisted his knee in the second half. Liverpool had to do without influential Dunlop in the next two matches which Liverpool lost 1-3 vs. Blackburn at rain-soaked Anfield and 0-5 vs Aston Villa. Despite their "melancholy experiences" in the League, the Liverpool players were in good spirits for their trip to Sunderland, not a favourite hunting ground for the Reds throughout the years. Liverpool spent the evening prior to the game at one of the music halls in town and whether that did the trick or not the Anfielders finally registered a win with the enigmatic Sam Raybould scoring twice in a 2-1 win. A fox terrier "who showed the liveliest interest in football" stole the show. "He raced for the leather amid roars of Homeric laughter, and Mr. Adams had to suspend hostilities until the little creature was forcibly ejected." Raybould's second goal was simply brilliant, controlling a good pass, taking the ball down the wing, tricking his opponent and shooting well out of the keeper's reach. A second consecutive win was recorded against Birmingham. History was not on Reds' side for this eagerly awaited clash. 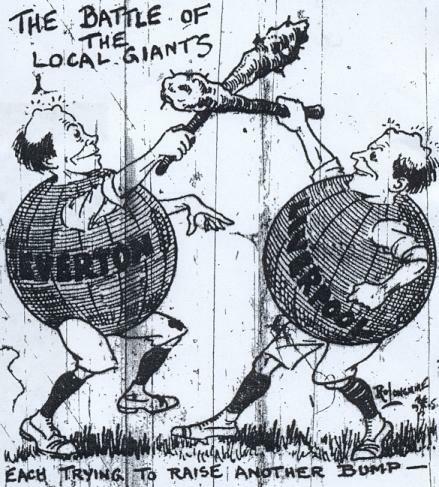 The Merseyside teams had played each other nine times in the league on Everton's ground. Everton had scored 25 goals in their 7 wins and only allowed Liverpool eight goals and one win. Liverpool showed much more gusto in the opening exchanges, Cox hitting the upright and Goddard scoring, but judged offside. However, Everton took the lead against run of play in the 15th minute with a goal from Settle and ran out 4-2 winners. 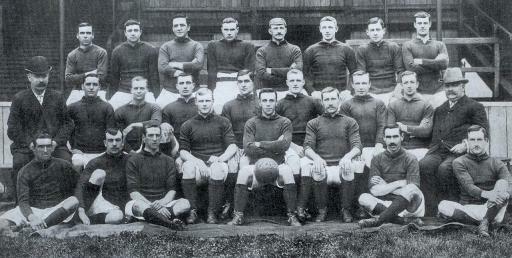 The top two sides were next, second place Derby and 1903 and 1904 League champions The Wednesday. Jack Cox was in impeccable form as Liverpool won Derby 4-1 but Cox and Raybould were sorely missed when Liverpool were beaten 2-3 by The Wednesday. Liverpool were in 16th place after 8 games with only 6 points. 22-year-old Sam Hardy made his debut replacing the legendary Sunderland keeper, Ned Doig, in the next game vs. Nottingham Forest as Doig was suffering from rheumatism. 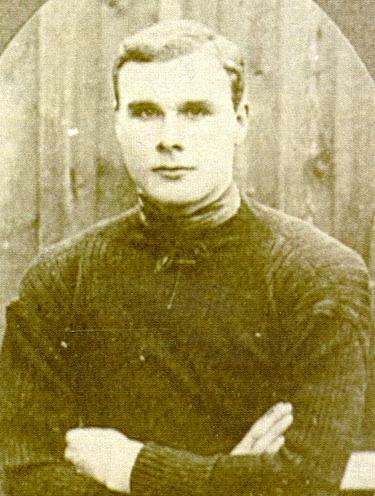 Hardy was one of the outstanding English goalkeepers of his time. He joined from Chesterfield in May 1905 and remained first-choice at Anfield for another 6 years before moving on to further success with Aston Villa. Liverpool won Forest 4-1 and went on a great run beating Middlesbrough 5-1 where Joe Hewitt grabbed a hat-trick. Getting a result against champions Newcastle at St James’ Park was no mean feat, but Liverpool beat the Geordies 3-2. 1st place Aston Villa came to Anfield and were buried 3-0, Sam Hardy saved a penalty from William Garratty in the match which also served as Sam Raybould’s benefit match. After winning 11 out of their last 14 games, Liverpool were top of the table on New Years’ Day with a three point lead on Aston Villa and The Wednesday. 2nd division Leicester Fosse were Liverpool’s opponents in the first round of the FA Cup at Anfield. Alf West no doubt never forgot this game as he missed two penalties, one in each half. 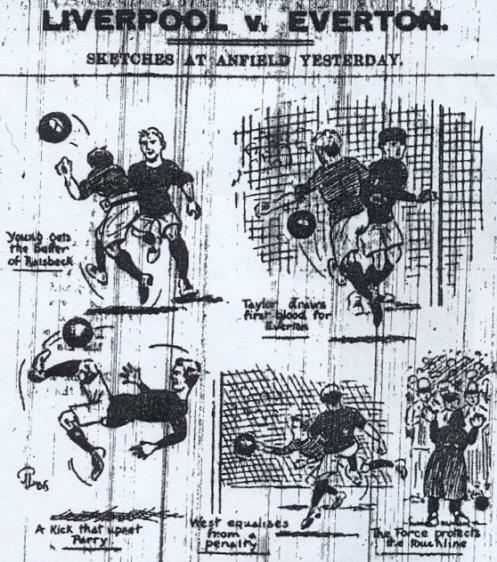 Leicester fared no better from the spot and Billy Bannister missed his spot-kick. Three penalty misses and three goals, Liverpool scoring two of them and progressing to the next round against another 2nd division team in Barnsley. Liverpool were drawn to play away but the tie was switched to Anfield by arrangement with the Yorkshire club. 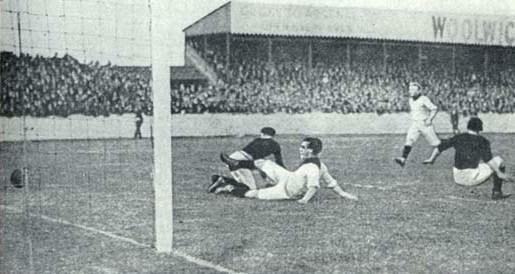 Alf West scored the winning goal. Liverpool were next drawn vs. Western League’s runners-up Brentfordwho had done well reaching this far in the cup. The Reds proved too much of an obstacle and Brentford lost 2-0. 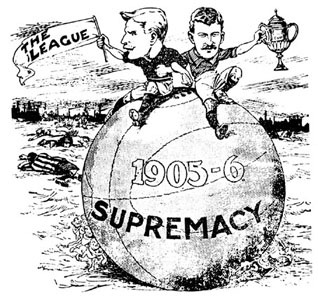 Southern league’s Southampton awaited in the quarter-finals, who after having disposed of Liverpool 4-1 in 1902, lost in a cup final replay vs Sheffield United. How Liverpool fought and died! That would have been their joy and pride. Then we'll all help to shout "Hip hooray!" This poetic supporter got his wish and Everton won the FA Cup by beating Newcastle 1-0. In between their exploits in the cup, Liverpool had kept their own in the league. After a 0-0 draw vs Bury on 2nd April, Liverpool had a four point lead on Preston, but North End had a game in hand. Liverpool was at the top thanks to 12 wins at home from 16, but the Reds had lost 7 away games out of 17. Liverpool had a four point lead on Preston with five league games to play but North End had a game in hand. Champions Newcastle were beaten 3-0 at Anfield, but the big scoreline flattered Liverpool with Sam Hardy in impeccable form. Another home game vs. Everton was next on the agenda. Everton went into the lead when Hardy dropped the ball after what should have been an easy save and Taylor capitalised. The game was on occasions held up by the dense crowds lined up around the pitch but Liverpool finally got a breakthrough when Taylor fouled Parkinson in the penalty area and West converted the penalty. 1-1 the result. The games came thick and fast and incredibly the following day Liverpool faced Wolves away. Preston North End were breathing down Liverpool’s necks only three points behind and still with a game in hand and Liverpool could not afford the slightest slip. Liverpool proved sharper than Wolves on the day and scored two goals without response. To boost Liverpool’s spirits, Preston lost to Stoke and the gap at the top had been widened to five points. Preston had three league games left compared to Liverpool’s two and the Reds only needed two more points to secure the title.Liverpool faced Bolton away and more than 1,000 supporters followed the team to Burnden Park. Liverpool dominated the opening exchanges and Goddard and Hewitt rattled the posts of the goal. Against run of play just before half-time Shepherd opened the scoring for Bolton after Hardy had failed to clear effectively after a corner. In early second half Shepherd increased Bolton’s lead with a brilliant goal. Parkinson reduced the lead, but Bolton got their third goal and despite Parkinson’s second goal, Bolton ran out 3-2 winners. The result did however not matter as Preston lost 2-0 at Sunderland. Liverpool’s five point lead was intact and as Preston could only get a maximum of four points from their last two remaining games Liverpool were champions for the second time in their history! Their Championship win was particularly impressive as they gave the other teams virtually a month’s start by losing their opening four games but didn’t let go of the top spot once they captured it in the middle of December. It proved to be a big season for the Merseyside clubs, Liverpool winning the League and Everton winning the FA Cup. EVERTON - I think we've about stripped the tree! LIVERPOOL - Yes, I think so; and if you're satisfied, I am! Jock Taylor: "We played our cards well this season, Alec." Raisbeck: "Yes, honours were even." Liverpool finished the season by winning certainly the largest trophy in the history of football, The Sheriff of London Charity Shield, which was over six feet high. 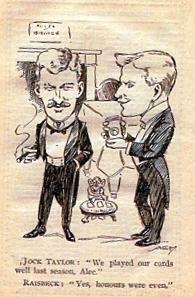 The competition originated from 1898 and was an annual game between the best professional and amateur side in England. The amateurs, Corinthians, were easily defeated 5-1 by Liverpool. A year later the competition was cancelled. The champions with the giant Sheriff of London trophy! Back row: Sam Hardy, Harry Griffiths, Maurice Parry, Robert Blanthorne, Charlie Wilson, Percy Saul, James Bradley. Middle row: W. Connell (Trainer), Sam Raybould, Alex Raisbeck, Joe Hewitt, Jason Hughes, [Sheriff of London Charity Shield], James Gorman, Robbie Robinson, Billy Dunlop, ?, Ned Doig. Front row: George Latham, [League Cup], Tom Chorlton, John Carlin, [Liverpool Cup], Jack Parkinson. 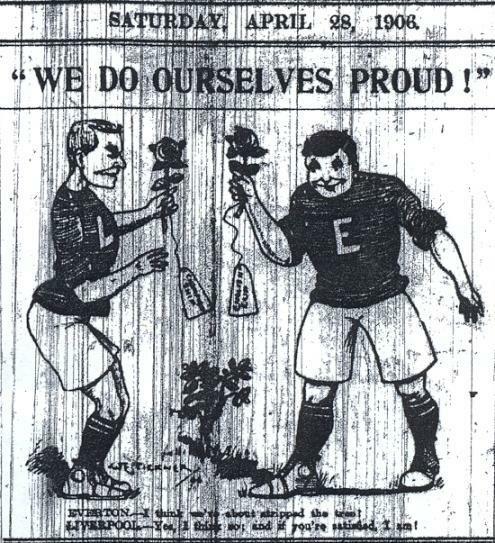 The Sports Spectator saluted the champions: "Perkins had vacated the goal area which was shared by the evergreen James Doig and silent Sam Hardy. The backs were West, Dunlop, Murray and Chorlton, a capital quartet. The half backs usually on duty were Parry, Raisbeck and Bradley; the Reds have never had a better line, if one so good, and George Lathom and Fleming occasionally rendered excellent service. In the forward line Goddard, Robinson, Hewitt, Raybould, Cox, Garside and Carlin knew the way to goal, as a tally of 79 goals scored in 38 games testified." LFChistory.net hopes you have enjoyed learning about Liverpool's early history which is after all the basis of the club that we all love today. Copyright - Arnie at LFChistory.net ([email protected]) - Quotes from Liverpool Echo.